For weeks I’ve been singing the Budapest song by George Ezra. 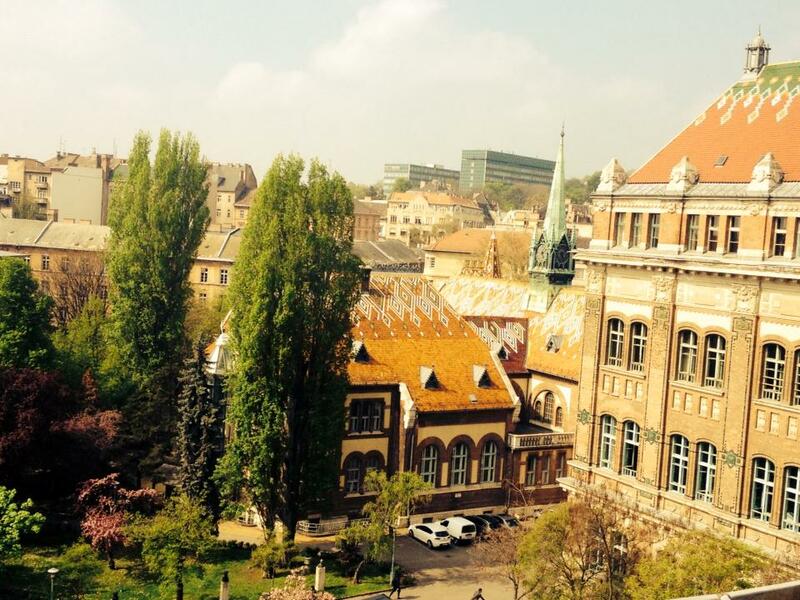 My heart’s in Budapest…na, na, a doobie doo. The first two lines were all I knew for quite some time (and I’ve discovered incorrectly too). The closer today has come, the more I’ve learnt of the song. Heart is actually house, and doobie doo is actually I’d lose it all. I’m so excited! Tonight I wing my way up the continent of Africa, and after a brief stop-over in Doha, Qatar, it’ll be only a few more hours until my husband and I land in Budapest. 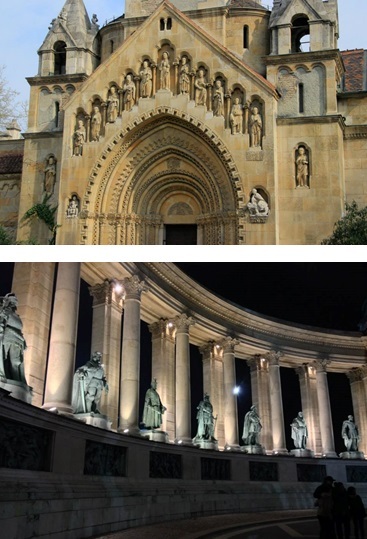 But the Budapest that waits will be very different from the one we visited for a few hours in the summer of 2012. No doubt, the snow covered city (please let there be snow…apparently they’re experiencing a warm winter) will be equally as fascinating, and even more beautiful. After we had experienced our summer cottage vacation in Finland some thirty months ago, we flew to Budapest where we caught a bus to Romania and spent a week helping to build houses for the Romanian gypsies. But that’s a story for another blog. On the way back to Finland for our long-haul flight home to South Africa, we had a layover of several hours in Budapest. While my hubby stayed at the airport to look after our luggage (he had a sore leg and didn’t want to go sight-seeing), my son, Kyle, his wife, Tiia, and I caught the bus and train into the city center along with two of their missionary friends, Samuel and Sara. I’m so glad we did—not only was it such a beautiful city to see, but it was that visit that drew Kyle and Tiia to set up their office for Re-birth in Budapest. It is said that Budapest and Prague are two of the most beautiful cities in Europe because they were not damaged by the wars. Here are some places we saw (unfortunately I don’t know the names of many of the places, but perhaps I’ll get to know some of them on this trip). 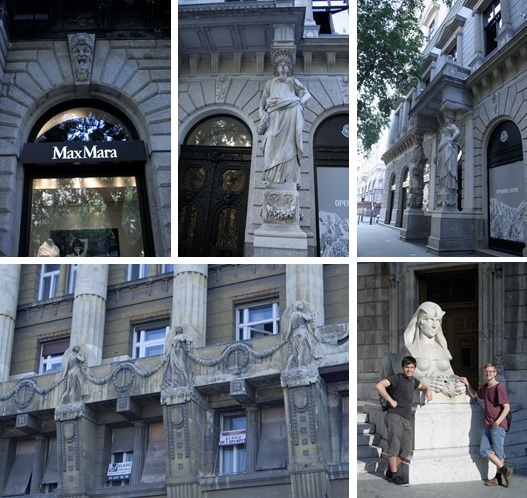 The statues on the buildings were fascinating…magnificent works of art. I loved the intricate lamp posts, curved streets and paved alleyways. This is the beautiful University that my daughter-in-law attended. A fruit shop, flower shop and pharmacy (yes, that’s what that strange word means). From the moment you spot its spires in the distance, St. Stephen’s Basilica has you spellbound. The artwork of this cathedral is breathtaking—from the large mosaic paved area that greets you outside, to the carvings, sculptures, paintings and pipe organ inside. One cannot help but stand and stare in awe once inside St. Stephen’s Basilica. The craftsmanship of the architecture and all the trimmings surrounding that is almost inconceivable. It’s simply, beautiful. In one part of the outer area, colorful stained glass windows let light into the room that houses them. They’re so exquisite that one almost doesn’t notice the strange phenomenon in the room their beauty brightens. 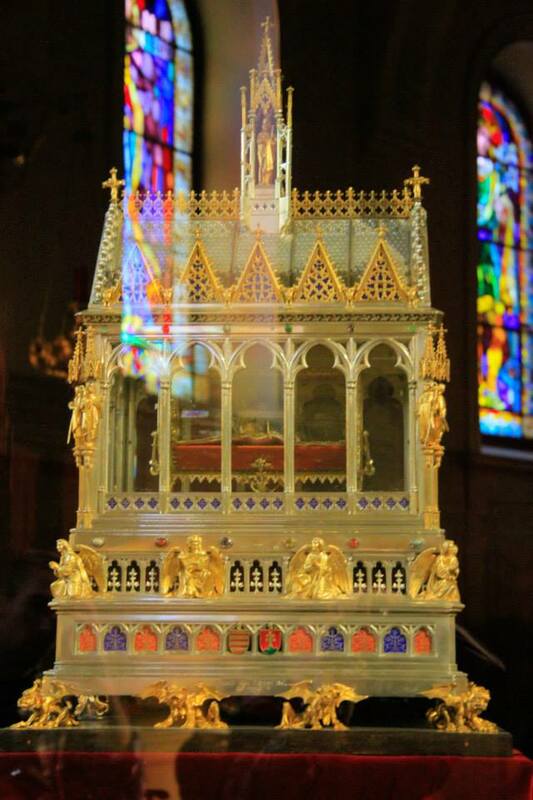 Inside this glass reliquary lies the right hand of Stephen, the first King of Hungary, in whose honor the basilica is named. In closing, what would this blog post be if I didn’t post a picture of the famous Danube River. Da-da-da-da-da, la-la la-la… What is it about this city that makes me want to sing all the time? I trust that you’ve enjoyed taking an escape with me to beautiful Budapest. 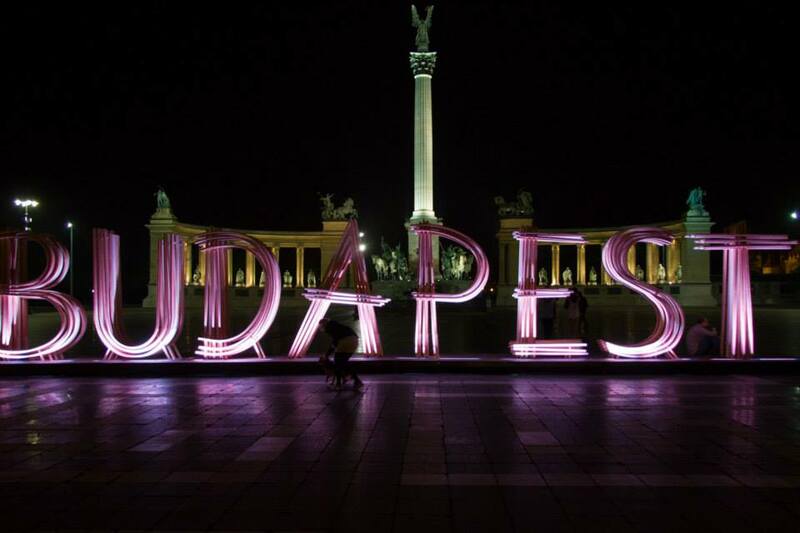 I am so looking forward to visiting the following places that my son and daughter-in-law have discovered during the time they’ve been living in Budapest: the colorful sweet shop; this death-by-chocolate coffee shop—Noir ChocoBar; the outdoor ice-rink in the city park; and the love lock park at Erzsébet square. Here couples inscribe a lock with their names. The lock is chained alongside a myriad of other locks and then the couples walk hand in hand across the Danube and toss the key into the river. I plan to visit one of the 80 geothermal springs (medicinal baths) in Budapest this coming week so hopefully I’ll have some photos of those to show in next week’s blog – Winter Budapest. 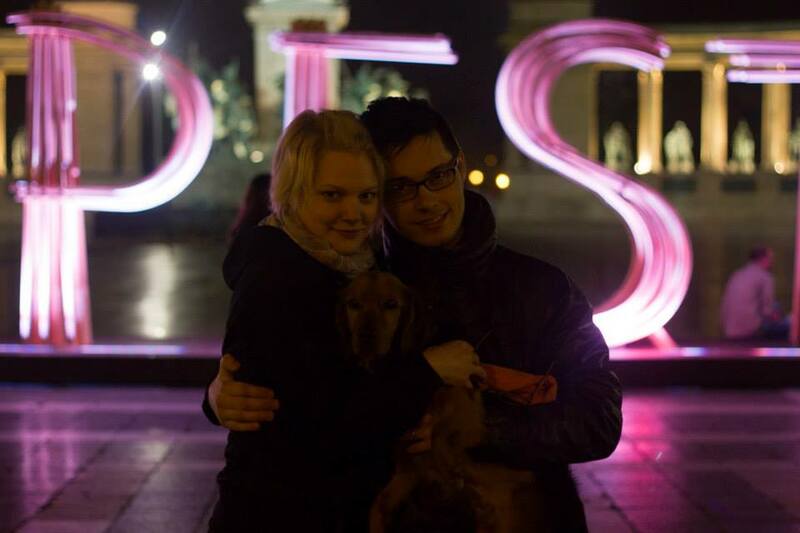 But more than all the awesomeness the beautiful city of Budapest has to offer, I’m looking forward to seeing this beloved sight tomorrow – my son and his wife (who are also my cover models for Helsinki Sunrise). Lovely blog about what looks like an exquisite city. As I write this you are well on your way to visit this city for the second time and spend time with Kyle and Tia. Have a wonderful time both of you. Love to Noel as well. Thanks for posting this, Narelle, Shirl. Oh, Shirl. I wish I was well on my way … and no, I haven’t fallen off a chair and broken any bones 🙂 Our flight is only at 20h45 tonight 🙂 I’ll be sure to post tons of photos on Facebook (as time and internet connection permits). Marion, I am sure you are enjoying every minute of you well deserved holiday. 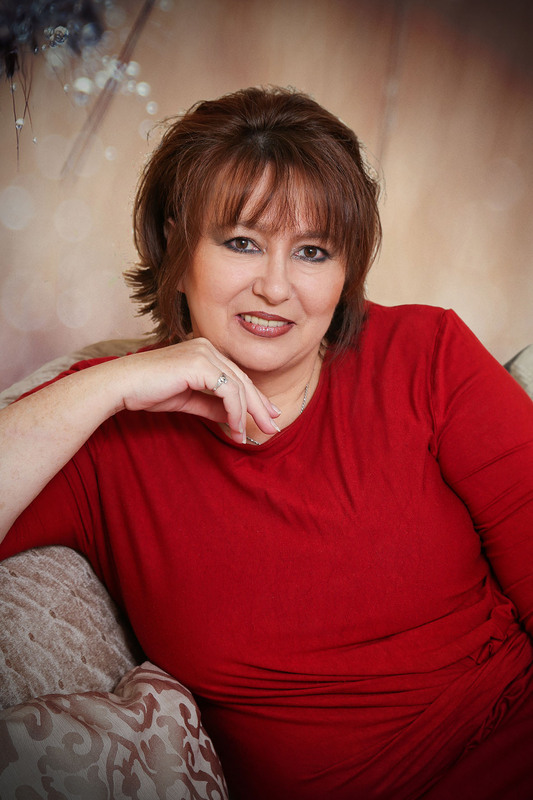 Can’t wait to have you back at work and all the wonderful stories you have to tell. All the best to you, Noel and the children during the festive season.